Just because a vehicle is brand new, it doesn’t mean that it is perfect. In many cases, new cars need to be machine polished to remove imperfections and to bring the gloss up to its full potential. Likewise, new vehicles come with no protection on the paint, wheels, glass, interior, etc. to keep it looking its best for a long time to come. Here at Detail Werkz Dallas, we work on a lot of brand new vehicles from daily drivers to exotics, and everything in between…we even have brand new cars shipped in to us specifically for our new car preparation to get them started off right. Because not every car is the same, and not every owner has the same wants and needs, we offer a variety of new car preparation and protection services. If you have a new car that you’d like to schedule for our new car preparation and protection services, or have specific questions, please call us at 972-880-7277 and we will gladly get you taken care of. Will the work you do void any paint warranty or dealer prep work? Our New-Car preparation & protection will provide the foundation that is recommended in your owner’s manual. Since we don’t use any petrochemicals, nothing harmful is being introduced to the car's interior or exterior finish. As for post-factory prep work, we don’t recommend any dealer application of “proprietary” sealants or polymers as this will jeopardize vehicle appearance and may introduce swirls, scratches, etc. during the application process. Will the new-car detail remove my “new-car” smell? Depending on the package, no. We’ve had clients that have told us their car still smells new almost a year after their purchase. Your driving, lifestyle, and care will determine the longevity of the new-car smell. Why should a perfectly new car be treated? Just like your body, your car needs care. If you have dry skin, you usually put on lotion. The manufacturer does not have a detailing department on the assembly line. They cannot devote the manpower and labor needed to treat the interior and exterior surfaces of the car. Your paint, for example, is set for deterioration the moment it left the paint line/booth of the factory. The outdoor elements, shipping, dealer prep, etc. only add to the damage. Getting it detailed properly using organic products will help diminish Mother Nature’s fury, the car wash, or lack of wash.
About how much time does a new-car detail take? The entire process takes between 1 to 2 days to complete. On more demanding details of ultra-sport and luxury cars, more time may be required. What do I do after this detail? Are there steps I can take to further maintain the appearance you guys worked to achieve? Absolutely. After the initial detail, maintenance is very easy. 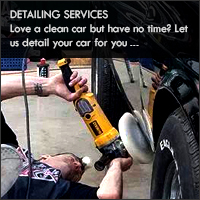 We can recommend a variety of products that will maintain the appearance of your new car. With our expertise in the industry, we’re familiar with most products and can guide you to use your favorite product line or recommend products. Because not all new cars come from the factory the same, not all new car preps are alike! But for most vehicles, our New Car Prep service will ensure that the car starts out right. If you just purschased a slightly used vehicle and want it to look better than new, then this is the package for you! New cars usually sit in shipping yards, are hauled across the country on trains or on semi-trucks, then spend more time sitting on the dealer’s lot. During this time the painted finishes in particular tend to collect abrasive contaminants, and small metal particles that embed into the surface (commonly referred to as rail dust). If not treated properly, this rail dust will start to show as very small rust blooms particularly in the lower areas (easily noticeable on white cars). During a new car prep, we will chemically neutralize these contaminants, and apply a durable layer of sealant to protect the finish from the elements. We also treat glass, and interior components as necessary. A new car prep at the dealership takes about an hour to 30 minutes, whereas ours takes 3-5 hours. Full paint decontamination with clay bar treatment (removes embedded road grime, tar, paint splatter). For customers looking to bring out the highest amount of gloss in their paint, and to provide all surfaces with the most durable and maintenance free protection possible (without paint protection film – clear bra), we are happy to provide our Premium New Car Preparation and Protection services. At this level, we are starting with a thorough washing and chemical decontamination of the painted surface, followed by a light one step machine polishing to remove the factory or dealership installed blemishes (swirls, light scratches, haze). This process polishes the finish and brings out the gloss, clarity and depth to much better results than factory. Once the one step polishing process is completed, we hand-apply 22PLE paint protection coatings that add even more gloss. Additionally, the durable 22PLE coating lasts 18-24 (real) months! If plastic trim is present, we also treat it with a very durable (over a year) plastic restorer from 22PLE. On the interior of the car, we start off by a pH-cleaning using Swissvax luxury car care products on the seating surfaces to ensure a high level of deep conditioning and UV protection. This process is recommended annually for the ultimate preservation of the delicate leathers and other interior items. All other interior surfaces are treated accordingly depending on their materials, and carpets and floor mats will be treated and cleaned. At this level of highly specialized detailing and protecting, you are getting a car in a condition that no factory or dealership can provide. This is for discerning owners looking for the absolute best in their cars’ looks and protection. Chemical decontamination of painted surfaces to remove any existing iron deposits that will eventually show up as tiny rust spots. Machine 1-step polishing to safely remove factory defects, swirls, light scratches and to increase gloss, clairty and depth of the paint. We offer complete wheels off deep clean and 22ple glass coating for additional $200. Vehicle will need to be left in our care for 3-4 days pending size of vehicle. Pricing depends on type of vehicle (size). Please call us for correct price quote for your vehicle. This level is just that…the Ultimate Werkz in new car preparation and protection. This includes everything in the Premium package above, plus it adds a full front end Paint Protection Film (aka “clear bra”) using the SunTek PPF clear film. What makes our installs stand out from the rest is the quality of the application itself (there IS a big difference from one installer to the next…just like detailing). Wherever possible, we tuck in edges of the film to minimize the amount of visible edges. This makes for a much cleaner look, and helps the film to “disappear”. When we do this level, we will actually install the film first (after polishing the paint to be free of any swirls, scratches and holograms), and then apply our 22PLE HPC glass coating on top of the film, as well as the rest of the un-protected painted finish.